Self-defense is very commonly argued in instances where one prisoner kills another prisoner. Hardly ever is it successful. It’s less likely to be successful when there is video footage of one prisoner chasing down the other prisoner for the purpose of stabbing him to death. Such was the case of 27-year-old Robert Hunt. His trial lasted one day and the jury delivered a verdict in less than one hour. The prosecution was able to produce three witnesses, all of whom supported the theory that Hunt was the aggressor and he killed the other prisoner because he either owed him money or stole something from him. For prosecutors and jurors, cases don’t get any more straightforward than this. When a criminal defendant asserts self-defense in a murder trial, they asserting an affirmative defense. They are telling a story that essentially admits that they ended another person’s life, but their reason for doing so was justified. When that happens, the role of the prosecutor and the defense attorneys are reversed. The defense now has the burden of proving that the act was justified while the prosecution can simply pick apart the defense’s story. In other words, it becomes the defense’s job to prove beyond all reasonable doubt that an individual intended to commit an act of violence against them or innocent bystanders. But the threat must be imminent. The individual who committed the homicide must feel as though their lives or the lives of others are in immediate danger. Stand your ground defenses are even stricter in some ways. The defendant must assert and show that the person who was killed was in the act of committing violence against them. 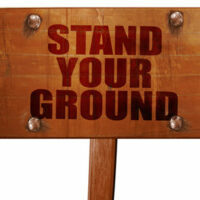 Stand your ground only means that, here in Florida, you have no duty to retreat. On the other hand, a recent ruling passed the burden of proof in stand your ground cases back to the prosecution. If a defendant has a valid reason to claim stand your ground in a criminal trial, the burden of proof shifts back to the prosecution to prove that the stand your ground claim was only a pretense. Of course, running after an inmate with a shank and then stabbing him till he dies does not pass an obvious standard for claiming either stand your ground or self-defense. Can I Kill Someone who Threatened Violence against Me? In general, in order to invoke self-defense as a defense in a homicide case, the threat must be immediate. It need not, however, be physical. The defendant can claim that the deceased made a physical threat against them and they responded violently because they thought the threat was credible. A jury would then need to decide if the fear of the threat was reasonable. In other words, would a “reasonable person” fear for their lives under the circumstances that the defense is asserting. That, of course, is entirely subjective. Now the defense attorney in the aforementioned trial made the claim that his client had a reasonable fear that is life was at stake, but most states require that the response be proportional to the threat, and the lack of corroborating witnesses proved fatal to his case. If you are facing criminal charges in Florida, we can help. Skier Law Firm, P.A of West Palm Beach can provide you with the best criminal defense for your case. Give us a call or contact us online and we’ll begin discussing your case immediately.